It sounds funny but it tastes oh so good. If this is the first time you’ve ever heard of National Pupusa Day, you are in for a tasty treat. This annual El Salvadoran holiday always takes place on the second Sunday in November with the date being November 10 this year. The pupusa, made with a tortilla-like flatbread filled with all manner of deliciousness, is now the national dish of El Salvador — a far cry from its humble beginnings as a staple in the diet of early Indian tribes. ​The world’s biggest pupusa measuring 33 feet wide and weighing about 200 pounds surpassed the world record at a fair held in a San Salvador park. ​The Legislative Assembly of El Salvador declared pupusas the national dish of El Salvador. Celebrations are held on National Pupusa Day, of course! ​If you lived in pre-Columbian El Salvador, you would have recognized pupusas because of their similarity to our modern version with one exception; early pupusas were shaped like half moons and filled with vegetables by the inventive Pipil tribes of western El Salvador. Who can eat the most pupusas in your neighborhood? National Pupusa Day is the day to find out. Put together a block party with your neighbors. Eating contests are widespread in El Salvador. Not only do they celebrate this beautiful gastronomic tour de force, but the government actually encourages citizens to make and eat pupusas as a way to help boost the culinary and agricultural industries. If you consider yourself a culinary whiz, think of National Pupusa Day as a challenge. Find out how creative you really are by making up a batch of pupusas and putting your own individual stamp on each one (not literally a stamp, but you know what we mean). The great thing about making pupusas is that vegetarians can play too. Pupusas lend themselves to vegetarian diets in a variety of ways. On National Pupusa Day, your local El Salvadoran restaurant is bound to be poppin'! You can learn so much about a culture just by eating the food. If there's no authentic El Salvadoran eatery in your city or town, just head out for some Latin American food. Be a tourist and spend time with people who are different from yourself. You might be surprised at what you can learn — mainly that we are all the same! In El Salvador, the typical pupusa only costs about a quarter but you can stay full for hours. A Washington D.C.-based restaurant once used proceeds from National Pupusa Day to help hurricane victims in Puerto Rico. ​Seems like women have the upper hand when it comes to making pupusas since thousands of women cook up pupusas for a living. ​Although there are traditional pupusa fillings made from rice, beans, shrimp, and cheese — you can also cook up unusual ideas like pupusas filled with duck comfit; or breakfast pupusas with scrambled eggs and sausage; or even dulce pupusas stuffed with bananas or plantains; and for a quick snack, bacon with sauteed jalapeno peppers and pepper jack cheese. Are you hungry yet? El Salvador is a small country in southwestern Central America bordering Honduras and Guatemala. As with so many Latin American countries, El Salvador was conquered by Spain in 1525. Finally in 1821, the country liberated itself, and this history is infused with the love of pupusas, the national dish, on National Pupusa Day. 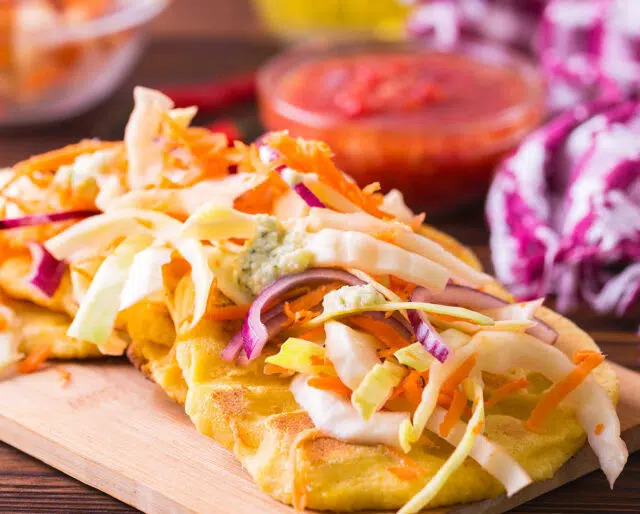 All pupusas are basically made the same way — with a thick corn flatbread reminiscent of a tortilla and stuffed with the filling of your choice. If you want to stay traditional, your filling will be cheese, meat, fish, beans, or veggies. Serve up a side portion of curtido, a spicy cabbage relish similar to a tangy coleslaw or sauerkraut. Get creative with your pupusas and stuff them with shrimp, squash, almost anything. Prior to the 1960s, pupusas were mainly eaten in El Salvador. But as people began to migrate out of the country due to political violence or crime, pupusas started popping up in Latin American restaurants around the world. For example, you can chow down on pupusas in three Australian cities including Adelaide, Melbourne, and Sydney. In the U.S. there are variations of pupusa stuffings made with spinach, pepperoni, and green chili peppers served up in Santa Fe, New Mexico.